Modern bathrooms are so much more than just a simple little closet than most of us visit to “do our business”. Today, bathrooms are designed specifically to be an oasis in our own homes, a getaway that allows us to relax, unwind, and release all of the stress and pressure that’s been building up all day. And though most people fixate on luxury finishes, luxury materials, and luxury fixtures in the bathroom, it’s becoming more and more important to get your hands on wall mounted towel warmers in a top-of-the-line bathroom to really maximize the comfort that you’re going to get out of this kind of space. Thankfully, the best ones of this kind are a lot less expensive today than they used to be in the past, giving everyone the opportunity to install one of these amazing luxury solutions in their own home. If you’re thinking about doing exactly that, here are some helpful hints, tips, and tricks to pull this project off to perfection. Wanna try transforming your bathroom into a luxurious and relaxing spa? Then you should try this WarmRails HSRC. And relatively compact without sacrificing any utility. 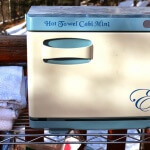 This hot warmer is perfect for those that want to elevate the style and functionality of their bathroom. Without any real extra effort. Or too high of a budget. Finished in beautiful chrome, the radiant heating technology used in this module is designed for 24 hour operation without any sacrifice in performance. And it doesn’t bring any safety issues to the table also. The WarmRails HSRC Regent is a multi-function style device. 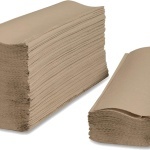 It gives you the opportunity to quickly and almost with no effort warm up so much more than just towels or washcloths. You’ll be able to drape bedclothes, bathing suits, and even blankets or sweaters with this model. And bring them up to temperature in record time. The heating technology built into this unit only uses 50 W.
But you’ll be able to bring whatever it is you’re trying to heat up to maximum temperatures of 120°F just by gently laying them across the crossbars. A bit on the expensive side of things (and somewhat of a pain to install on your own). But I think you’re going to love this one. Most options out there are of the “plug in” variety. But this Amba RWH-CB is different. … But the advantages that you will enjoy far outweigh that minor inconvenience and minimal extra cost. With a hardwired option like this one, you can pretty much forget about inconsistent heating issues, unpredictable energy bills, and safety or performance issues that you wouldn’t have been able to foresee. Instead, with this hardwired option, you’ll enjoy consistent results across the board. Without ever having to worry about safety issues or your energy bill coming in significantly higher than you expected. Made out of 304 Grade stainless steel (one of the most beautiful and structurally sound materials out there). This towel rack is going to heat up in a hurry and provide you with long-lasting results almost from the moment that you first power it on. Yes, you are going to have to have a little bit of professional help installing it in your bathroom. But a top-of-the-line product like this is well worth the cost. You’re going to have a very hard time trying to find one better option than this WarmRails HW/SW Kensington. Specifically designed to mount to any wall in any bathroom, closet, or bedroom (using household tools and nothing more). You’ll have the option of hardwiring this unit directly into your electrical service – which may or may not involve calling in professionals to help you out. Or you can plug it into any traditional wall outlet so that you can get up and running in record time. One of the more powerful wall mounted options, the Kensington uses a 105 W power supply. 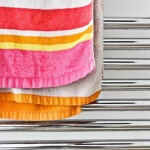 With that, it can produce incredibly efficient and consistent heat throughout the towel rack. 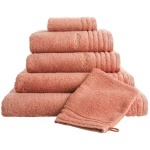 You’ll never again have to worry about some of your towels heating up and some of them staying a little chilly again. Yes, it’s a bit more expensive than some of the other options. But it comes with a great warranty so that you have peace of mind in purchasing this product. And it is easily one of the best reviewed products on the market today. You really can’t go wrong with this one! Ah, I like this one also. The Amba RWH-CP just might be the most beautifully designed product on the market today. Exactly the kind of device that you would expect to find at any high-end resort or luxury spa. Absolutely everything about the look and aesthetics of this model are as good as it gets. 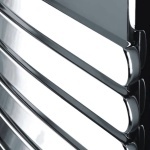 Manufactured entirely out of 18/8 stainless steel construction materials. And then polished to an almost impossibly mirrored finish. Everything about this option is high end – including the heating performance that it offers. This product uses a new and energy efficient radiant heat technology. The electrical “brain” of this product make sure that every single stainless steel surface on this wall-mounted unit is brought up to temperature (a maximum of 120°F) in 15 minutes or less. And then holds that temperature for at least 45 minutes or more without you having to lift a finger along the way. 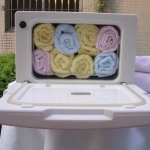 Even better, it can accommodate up to 10 towels without any difficulty at all. And it can also warm up blankets, sweatshirts/sweaters, dry bathing suits, etc. – the sky is quite literally the limit! It might be slightly more expensive than some of the other contenders out there. But you’d love to have this one for your home. I promise! That’s what I can say about this product. The Amba J-B004 P Swivel Jill deserves one spot among the best. Smartly designed so that it mounts directly to any bathroom wall. This towel warmer attached to the wall on one side only – leaving the rest of the rack to swing and pivot on silent hinges. That way, you get to use every square inch of the heating element when looking to warm up towels, bathing suits, blankets, or bedding. Beautifully designed with a unique and modern aesthetic. Absolutely everything about this device screams high-end finish. And the results definitely aren’t going to disappoint, either. Most people agree that the Amba J-B004 P fits the bill for everyone looking to create a spa like experience in their bathroom. Wanna give it a go? Many people loved this product. And I’m glad to tell you that there is currently a very good listing on this product. 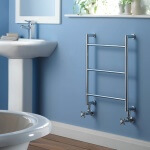 Standalone towel warmers are going to (almost always) be a lot cheaper than wall mounted ones. That’s simply because they don’t require special installation and can be set up almost anywhere. 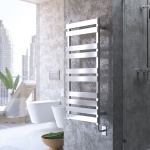 But wall mounted towel warmers – the kind that are hardwired directly into your homes electric system or plumbed into your hot water supply – have a lot more to offer you. I’m talking about extra utility, functionality, and design benefits that you simply aren’t going to be able to get out of freestanding or cabinet solutions. That’s good if you really want to upgrade your bathroom, right? 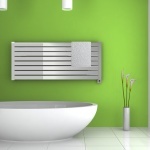 First, wall mounted towel warmers are among the “cleanest” looking devices you were going to come across. These products look exactly like the kinds that you’re going to find in high-end hotels, luxury spas, and prestigious salons. They are going to attach directly to your studs and will be wired inside of the wall, giving you a very clean, minimalist, and modern aesthetic to your bathroom. On top of that, they aren’t going to eat up very much for space – or any for space at all, for that matter – in your bathroom, either. They are going to take a wall space (very little wall space, at that), all while offering a tremendous amount of functionality and utility and the exact same time. Most of the best wall-mount towel radiators are also going to be able to provide you with a lot of extra capacity that you simply aren’t going to be able to get out of standalone or cabinet style towel warmers. 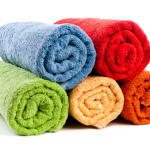 The best options are oversized, can accommodate a handful of towels at once or even heat blankets, sheets, and winter coats, opening up a tremendous amount of extra utility that you simply wouldn’t have had access to before. The heating power that you’re going to be able to leverage with the wall mounted warmers is unparalleled. Sure, “plugged in” towel warmers are going to be able to get pretty toasty in a hurry. But they aren’t going to be able to deliver the same kind of consistent power that a hardwired solution will be able to – and they certainly won’t be able to heat quite as efficiently or as quickly as radiant hydronic wall mounted warmers can. At the end of the day, it really doesn’t get much better than this. Of course, if you’re going to be in the market for a top-of-the-line wall mounted towel warmer, you need to be sure that you know exactly what separates the best of the best from the rest of the pack. The initial investment – You should know that it’s really hard to find a good deal on this type of product that is under $100. So, expect to pay a decent amount of money in exchange for a good one. The installation process – Mounting a towel warmer isn’t all that difficult (and can be done by anyone with household tools), but hardwiring it into your electrical system or plumbing it into your hot water is going to necessitate hiring a professional most of the time. Who made the product – you to need to be sure that you’re only purchasing products from those in the business with a reputation for creating high-end solutions that last for years and years at a time. After all, you don’t want to find out (after spending close to $1000 or more) that your new towel warmer isn’t all that effective or is on the fritz – and that you have no real recourse, either. Another detail to zero in on would have to be finding the right space in your bathroom to install this wall mounted solution. The bathroom isn’t usually the most cluttered space as far as walls are concerned. But if your bathroom is a bit on the smaller size you might have to toss out some artwork, lose some storage space, or pull out some cabinets to accommodate your new warmer. At the end of the day, these are probably the most popular and useful of all the different towel warmer options money can buy right now. And hopefully, I’ve been able to share with you enough good information to make the shopping process a little bit easier. I hope you’ve had a good time with my short buying guide. If you need any help on deciding which one is for you, then I’m here for a chat.